The following is an extract from an article written by Bob Davies and Bob Hobley which appeared in the January 1989 issue of the Morris Ring Circular. Born some 5 years before the outbreak of the First World War, 1989 sees Martin Jolley celebrate his 80th birthday. 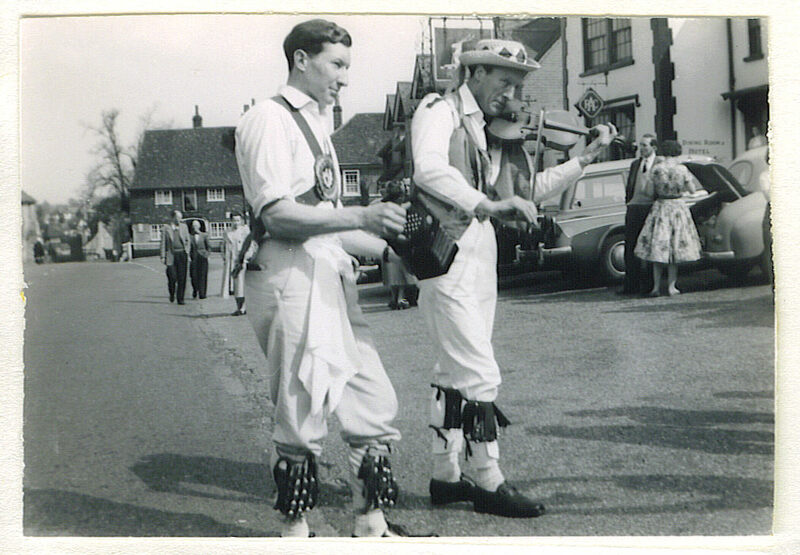 It was 37 years ago when Martin joined East Surrey Morris Men as a dancer who had previously only indulged in “community dancing” as it was then called. East Surrey, at the time, were suffering with a concertina player who really played the piano and seemingly could not get out of the habit. Martin was therefore dragooned into being the side’s musician, but his natural dancing ability and high talent as a violinist, enabled him to take to Morris musicianship as if he had been playing it all his life. The concertina player gratefully returned to his piano! Martin’s long association with ESMM was almost prematurely curtailed in the late 1950s during a day tour along the North Downs. Having just completed a very satisfactory afternoon performance at a medieval fayre, despite the effects of the mornings libations, Martin decided to take on the challenge of tilting the quintain. He failed. More seriously though, in tripping over, he damaged a vertibrae which left him paralysed for nearly a month. Fortunately, time and the deft manipulations of Webber (London Pride) restored Martin to his former active state and, within a year, a complete recovery had been effected. Although he refuses to admit it, tilting the quintain remains one of Martin’s most frustratingly unfulfilled ambitions. Not only is Martin a naturally gifted fiddler, he has also been the mentor of every East Surrey musician over the last 35 years, eagerly accepting the responsibility of training and advising budding Kimbers and Wells. The current strength of East Surrey’s music owes everything to his leadership, direction and tuition which, even now, is still being unstintingly provided. In his speech at the 1976 East Surrey Ring Meeting in Guildford, Bob Davies, the then Squire of ESMM, described Martin as “the doyen of them all”. More than 12 years have rushed past since then, but that phrase is still probably the most concise and apt way of summing up a man who has devoted nearly half his life to the Morris and to a very grateful East Surrey in particular.